The family of a man shot and killed late Tuesday by police in Baton Rouge, Louisiana, has spoken out against a fatal attack on Dallas police during a protest over officer-involved shootings late Thursday. The family of Alton Sterling condemned attacks against Dallas police as "reprehensible acts of violence" in a statement released Friday. 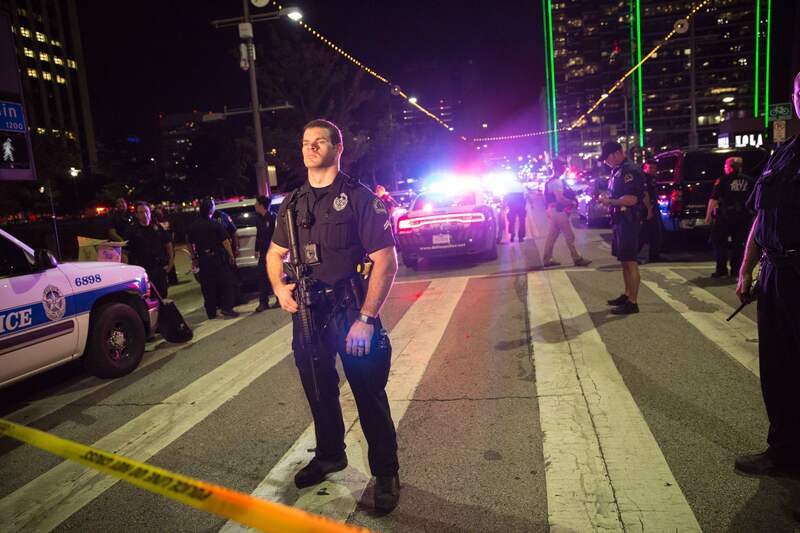 Five officers were killed and seven others were injured overnight Thursday when gunmen opened fire on police during a protest in downtown Dallas in what is being called one of the deadliest violent attacks to target law enforcement members since the Sept. 11 attacks. Quinyetta McMillon, Sterling's partner and mother to his son, Cameron Sterling, rejected Thursday's deadly attack against police in Dallas in a statement released through her lawyer Friday. "We wholeheartedly reject the reprehensible acts of violence that were perpetrated against members of the Dallas Police Department," she said. "Regardless of how angry or upset people may be, resorting to this kind of sickening violence should never happen and simply cannot be tolerated." Thirty-seven-year-old Sterling was shot and killed by police officers outside a convenience store in Baton Rouge after a homeless man reported Sterling, who was selling CDs, had shown him a gun when he approached to ask for spare change. Responding officers tackled Sterling to the ground and shot him multiple times, according to video footage of the incident. Sterling's death and the shooting of Philando Castile during a traffic stop in Minnesota on Wednesday sparked largely peaceful protests against police violence and officer-involved shootings in cities across the country Thursday. In her statement condemning the attack against law enforcement in Dallas, McMillon reiterated her request for the officers involved in her husband's death to be held accountable for their actions while expressing sympathy for the families of those killed in Dallas. "Our hearts break for the families of the officers who were lost as they protected protesters and residents alike during a rally," McMillon said in a statement. "Members of law enforcement have a very difficult job and the vast majority conduct themselves honorably as they protect and serve our communities." Dallas Police reported Friday morning one of the suspects had told a hostage negotiator he was angry over the deaths of Sterling and Castile and "wanted to kill officers." The suspect was killed by police in the attack and was not reportedly affiliated with any group connected to or involved in Thursday's protest. "Responding to violence with violence is not the answer," McMillon said Friday.